UO is a free software program designed to simplify common tasks in the popular MMORPG Ultima Online. It is designed to provide a free alternative to the popular program UOAssist which works on player run servers as well as official game servers. It is written in both and for use on Windows systems. – Fixed force game size for new clients. – Updated the bard music filter with the bamboo flute and dread flute. – Added the emote sounds filter. – Macro hotkeys are now always stored in English in the profile file. This fixes a bug where macro hotkeys would reset when switching languages. – Fixed UOAM display houses compatibility. – Fixed a packet handler exception on OSI shards. – Fixed the scavenger agent on OSI shards. – Added Target Random/Closest Murderer Humanoid/Monster hotkeys. – “Smart CPU reduction” now defaults to unchecked for new profiles. – Improved client stability for Windows Vista/7/8/10 with Aero turned on. – Enabled Windows theme support. – Fixed the updater not loading properly on Windows XP. – Fixed “Filter repeating system messages” from causing cliloc errors. – Several engine optimizations for modern clients. – Update check frequency has been reduced from every 3 hours to daily. – Fixed scavenger overloading the drag drop queue. – Removed client censoring of labels engraved on items. – Auto open doors no longer closes sliding doors. * If skipped, the last used data directory will now be used. * Improved error messages during client launch. * If an error occurs during launch, the welcome screen is turned back on. * The “No CliLoc” error will no longer display if a valid data directory is set. * Added support for UOP map files. * Fixed a crash caused by loading absent fonts. * Now always displays X,Y coordinates. * Now properly updates position on smooth moving boats. – Added edit option to macro speech actions. – Updated weapon abilities to latest client (can be customized in aosabilities.def). – Fixed counter images for client 7.0.24.0 and up. – Added -M command (shortcut for -Macro). – The light levels filter now restores the actual light level when disabled. – Auto-stack resources at feet will now drop resources next to the character. – Fixed movement in macros. – Added chivalry spells to spell formatting. – Fixed occasional splash screen error message. – Miscellaneous new packet compatibility fixes. – Re-added Windows XP support. – Fixed a drag drop bug that caused items to disappear. – Fixed new multiclient warning from showing. – Added support for client 7.0.30.0 and 7.0.33.1 changes. – Corrected the OSI server address. – Fixed minor UI bugs. 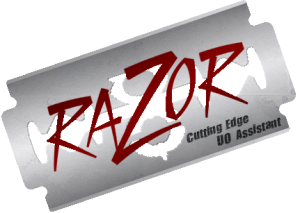 Copyright © 2019 UO Razor. All rights reserved.